AIA Chicago presents the 2019 Design Excellence Awards, an annual awards program which honors the best work by Chicago architecture firms found worldwide. Entries may be submitted by architecture firms based in the Chicago metropolitan area, defined as the counties of Cook, DuPage, Kane, Lake, McHenry, and Will in Illinois, and Lake and Porter counties in Indiana. Projects may be located anywhere in the world. Projects located within the metropolitan area but designed by architecture firms based outside Chicago may also be submitted. Projects must be designed by registered architects. Firms are encouraged to re-enter projects previously submitted if they did not win an award. Projects that have received an AIA Chicago award are not eligible for another award in the same award competition, but they may be entered in a different competition. - The same project may be submitted in multiple competitions. If the design team includes more than one firm, any member of the team may submit the joint project. All members of the design team must be acknowledged in the entry, and a member of the non-submitting firm(s) must provide a release indicating that they are aware of the submission. Each entry will be judged for the success with which it meets the individual project program, intent and requirements. Each entry will be weighed individually for its merits, not in competition with each other. Any project that credits a jury member or a jury member's firm as architect, associate architect, consultant, or client is ineligible and will be disqualified if submitted. Image created for the client through the project. How the detail relates to the goals of the overall project. Urban Design Award: The purpose of the Urban Design Award is to recognize distinguished achievements that involve the role of the architect in urban design. These projects should demonstrate innovative, civic-oriented approaches to planning, design and development of urban, suburban and regional development. Submissions can range in scale from city master plans, campus planning, planned developments, community developments, public or civic spaces, or design elements within a pubic or civic space. Approaches to design should contribute to the quality of urban, suburban, or regional development. Projects should not be individual buildings or solely landscape design. Since many urban design projects are never completed in the traditional sense, incomplete projects or ongoing programs may be recognized if a significant portion has been completed, implemented, or adopted by a local jurisdiction or authority. Entry fees are nonrefundable. There is no limit to the number of entries that may be submitted by an individual firm. AIA Chicago reserves the right to disqualify any submission not adhering to these requirements and may rescind any award so bestowed. Please note that rules and regulations have been updated since 2015. Images include drawings and photos. Maximum 10, minimum 4 pages/slides, arranged in the order you wish them to be viewed. No more than 2 drawings or photos per page/slide. Site plan and floor plan as appropriate to the project are mandatory, including North arrow and graphic scale. REQUIRED FOR DISTINGUISHED BUILDING AWARD: One image showing each exposed side of the building or environment. REQUIRED FOR INTERIOR ARCHITECTURE AWARD: One image showing the building's exterior. REQUIRED FOR ALL CATEGORIES: Site plan and floor plan as appropriate to the project, including North arrow and graphic scale. Maximum size per file: 10 MB; JPGs or JPEGS only. Images may be edited to improve contrast ratio, color balance, and composition through cropping. Images may not be edited to add, remove, or alter any aspect or element of the project including its context. Images should represent the project as it exists in the built environment. Artistic composition must not confuse the jury as to the nature of the project. Project designers may not be revealed in any of the submitted materials. PROJECT DESCRIPTION: Written information shall be limited to 250 words, including: Statement of program and contextual background. In addition, include any special challenges or considerations, unique and/or innovative solutions, lessons learned, or other information pertinent to the understanding of the project. Project authorship may not be revealed in any of the submitted materials. SUSTAINABILITY: New AIA Chicago guidelines require entrants to complete a set of questions regarding measurable standards of sustainability. They will also be asked in 2018 whether or not the submitting firm has signed on to the 2030 Commitment. The intent of the awards is to honor those firms and individuals responsible for the submitted designs. AIA Chicago has always honored other team members as part of the awards process. However, it is critical to the integrity of the awards that the primary actor receive the primary credit. Entering the competition is a representation that the submitting firm is responsible for the submitted design. This must be the case or the entry is not eligible for consideration. The architect or firm of record, associated architects, project team, consultants, general contractor, and client shall be identified on submission forms. Client names will be withheld from publication on request. Submissions from architects working as an employee or consultant to a firm must include a release from a principal of that firm acknowledging that the submitting architect had primary design responsibility and that project credits are correct. Credits should be listed as they would appear in print and online. Note that by uploading images, you are agreeing that your firm has prior licensing approval to use the images and allow AIA Chicago to display them for promotional and marketing purposes with proper attribution. The AIA Chicago office will notify winners immediately following the jury deliberations. Non-winners will be notified by mail. 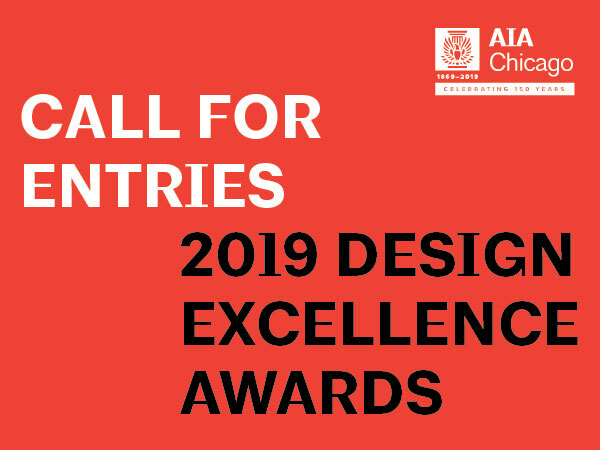 No public announcement of any awards will be made by AIA Chicago prior to the awards presentation at Designight on October 26, 2019. Winners are asked not to make their own announcements prior to Designight. The Design Excellence Awards will be presented at Designight on October 25, 2019, at Navy Pier’s Aon Grand Ballroom, 600 E. Grand Avenue. Award certificates will be given to the architect, owner, and contractor for each project. Winning projects will be documented in Chicago Architect magazine. These projects will also be highlighted in a presentation that includes all awards submissions on the chapter Web site. AIA Chicago will also undertake a public relations campaign on behalf of the winners. Submissions are accepted online via this site from March 28–June 4, 2019 at 11:59 PM. Click here for more information about Designight 2017. View the winners of the 2016 Design Excellence Awards here. View previous Design Excellence Award winners and submissions here.